A homemade terrarium is a great way to make your space appear more lively. Succulents and cacti are perfect for keeping in your room because they do not need constant direct sunlight and only require a little water and minimal care. You can forget about these plants for a month or two and they still will be just as green and perky as before. They are extremely low-maintenance and perfect for the busy college student. -Cover the bottom of the bowl with a thin layer of charcoal pieces. The carbon helps with filtration and preventing mold due to a lack of drainage in a closed terrarium. -Cover the charcoal layer with a layer of pebbles, rocks, or gravel of your choice. This is for filtration so water drains and doesn’t supersaturate the soil. -Cover the charcoal with fast-draining cactus soil. -Arrange the plants where you want them. -Decorate the finished product with stones or whatever else you choose. Adding mason jars to your room adds an instant hipster-country vibe to your overall space. Plus, your stuffy dorm room can never have too many candles. -Place desired amount of rocks, marbles, sand, etc into the jar. -Place tea light candle in the jar with the tin of the candle somewhat submerged. 12 16oz Ball brand mason jars from Walmart for $11. Lavender tea light candles from The 99 Cent Store for $1. Decorative gold sand from Walmart for $4. 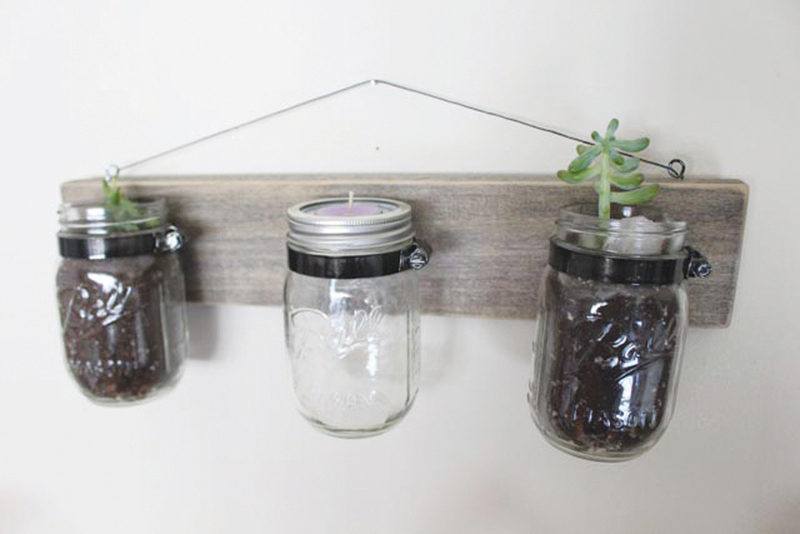 Make your room feel more homey by adding mounted mason jars to your walls. You can fill them with tea light candles, plants, jewelry, and even use them for storing small items like pens and pencils. The possibilities are endless. -Sand the piece of wood until smooth. -Wipe down excess dust or dirt to prepare for staining. -Thoroughly stir your stain without creating bubbles. -Take a rag and dip it into the stain and rub stain with the grain onto the wood and leave on until desired shade. Leave on for no longer than 15 minutes. Do not let excess stain dry. -Wipe down wood with a clean rag to remove excess stain. -Repeat the staining process if you want a darker shade. -Mark desired location of the hose clamps with a pencil. -Repeat step until all three hose clamps are secured. -Screw in mounting brackets on both ends of the back side of the wood with wood screws. -Secure the metal mounting wire by attaching it to mounting brackets on both ends of the piece of wood. -Tie the metal wire to one side of the mounting brackets. -Take picture-mounting hooks and screw them into the top of the wood for support and balance. -Run metal wire through the hooks. -Tie the metal wire to the other side of the mounting brackets. Cut excess wire. -Take your mason jars and place them in the hose clamp, under the lip of the mason jar, and screw the clamps closed. Make clamp is tight around the jar so it does not fall through. Places/prices of the products used:. Wood stain from Home Depot for $4. Twelve 16oz Ball brand mason jars from Walmart for $11. Hose clamps from Home Depot for $2. One pack of picture mounting bracket set from Home Depot for $6. Wood screws from Home Depot for $2. 220 grit sandpaper from Home Depot for $4-$5. 100 lb. metal wire from Home Depot for $5. Dreamcatchers are used to catch bad dreams and rid the sleeper of future nightmares. It also channels good dreams to the sleeper. Making your own dreamcatcher is beneficial because you can pour your own positive energy into it as you make it. -Hot glue the 3 sticks together in the shape of a triangle. -Let the glue dry and the wrap some twine around the ends to help secure the sticks together better. -Wrap the twine around the sticks in any pattern you desire securing it at the ends. -Braid and tie pieces of colored yarn to the bottom of the dream catcher all at different lengths. -Add on charms, jewelry, and/or beads to the twine, hanging yarn, and wood by gluing or tying them. 3 sticks from my backyard. 30 yards of jute twine from Target for $1. Glue gun from Walmart for $3. Glue sticks from Walmart for $4. Arrow charms from Walmart for $3. Yarn from Walmart for $5. Making your own photo clothesline is a great way to display your photographs while saving tons of wall space. -Measure out desired length of yarn or twine depending on where you are going to hang it. -Secure desired photographs on with the clothespins. Burlap letters from Walmart for $3. 50 mini wooden clothespins from Walmart for $2. Printed photos: prices and places may vary.